When buying a baby monitor, parents seeking out helpful advice are often met with sometimes-complicated tech terms and contradictory reviews. Most look to a monitor’s “range” as an indication of a good monitor, but there are a lot of other factors to keep in mind — ones that might turn out to be deal breakers. Hence rule #1: Always keep your receipt. One of the most important factors is frequency. The more electronics you have clogging up a particular frequency (whether it’s 2.4 GHz, 900 MHz, etc. ), the more interference you might have. That’s the reason why some homes can’t pick up a signal. Yet the reality is that we often don’t know what frequency our wireless devices run on (cell phones, wireless routers, cordless phones, laptops, etc.) — including what our close neighbors are using — so it could be a trial-and-error process. Static and signal issues could be coming from other sources too, like your house itself. A monitor’s advertised range (how far a monitor’s signal can reach) is measured in an obstacle-free environment (which most homes are not), so the number is fairly relative to where you’re living. A monitor that claims to work 2,000 ft. away from the baby unit will more likely have a stronger signal than one with a 350-ft. range. But if you only need a monitor for a few rooms away (rather than for a multi-story house, or to reach out in the backyard), then pretty much any range will do. The third feature to consider is digital vs. analog monitors. Traditional analog monitors are basically radio transmitters — meaning there’s a chance that a neighboring family can pick up your baby’s cries on their monitor, or a trucker’s radio scanner can tune into what’s going on in your baby room. The newer (and more expensive) digital monitors encrypt the sound from monitor to receiver, making it impossible for outsiders to listen in. The last thing to consider is which features you’ll want. If you’re heading back to work, you might want a wireless network monitor that allows you to check in from your smart phone or computer. 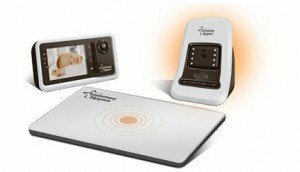 If you have multiple kids or if you’d like to monitor several rooms at once (i.e. 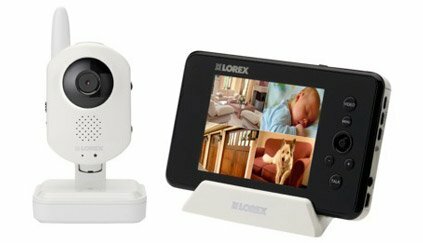 “The Nanny Cam”), choose a monitor that can be expanded to three or four cameras. If you know that constant surveillance will keep you on edge, opt for a basic audio monitor. 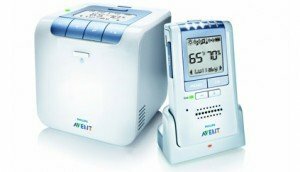 If you want to know what’s going on at all times, find a monitor with features like movement/temperature/humidity sensors. Pink’s list of baby monitors, we rated these while looking for clarity (both audio and visual), ease of use, battery life, range, and unique features. Video monitors can give extra peace of mind — and some serious entertainment as your little one gets more animated. But most have to be positioned just right, and you still have to hope your baby doesn’t roll out of the shot. Yet with the Summer Infant BabyTouch, you can use the large 3.5” color touch-screen (with smart-phone technology) to pan, scan, and zoom in on your baby. 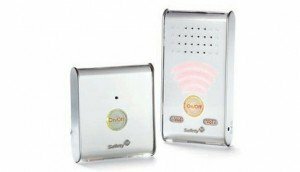 You can also use the two-way intercom to chat with your baby from a distance, giving a sense of comfort and security (great for sleep-training parents). We also like the sleek charging station and extra battery pack, in case the power goes out, as well as the clear video in both day and night. To top it off, you can add three cameras (Sold Separately, $99.99 each) for multi-room monitoring. If you’re more concerned with clarity and reliability than video capabilities, the Philips Avent is our very top pick. In fact, we liked this monitor better than even our favorite video monitors. This 1.9 GHz digital monitor (a newer frequency, exclusively for voice-only electronics) is less likely to interfere with electronics in the house (read: no static), and is digitally encrypted for a secure transmission — so truckers passing by won’t hear your frantic binkie search. And even though there’s no visual, the newer 535 model is packed with better features than a screen — including walkie-talkie-like, two-way communication (so you can soothe your baby from bed, or, more likely, tell your husband to grab the red blankie), temperature and humidity sensors (which also help determine if your pricey humidifier is actually working), music lullabies (that sound pretty, not grainy), and an optional, softly lit night light. If you need to mute the sound (maybe you’re trying to focus on working, or you’re in the middle of a movie, or you can’t bear the sound of sleep training), you can rely on vibrations and/or lights that activate when your baby starts crying. While the Philips is a bit pricey for something that doesn’t have the “fun” bells and whistles — like being able to check in from your iPhone in China or taking snap shots of your baby rolling around for the first time — it has absolutely everything you need in a reliable, easy-to-use package. For the tech-challenged, this is the best performing monitor with the least amount of complications: one transmitter, one button, one function. Unlike basic analog monitors on the market (which cost significantly less), the Safety 1st’s DECT 6.0 technology is less likely to pick up interference from other electronics or other analog transmitters — and our multiple testers had no clarity issues. And with all its simplicity, this monitor still comes with helpful features, like sound-level lights (a setting that alerts parents of noise through lights rather than sound — in case you’re on an important business call or you can’t stand the sound of sleep training), a pager button, and low-battery/out-of-range alerts. We also appreciate the sleek, non-eye-sore look for such a basic design. As far as battery life, the rechargeable battery might start to give out within the first year or two (according to reviewers who have used it longer than a few months), but we didn’t experience any issues — especially because you can keep the units plugged in. If you’re looking for the ultimate of ultimate baby monitors — enough to impress even the geekiest tech fiend — this is it, my friend. Made by Lorex (a brand known for their wireless surveillance cameras), the LIVE SD 3.5 has pretty much every feature you could want, packed into one sleek, modern, and simple-to-use monitor. First there’s the impressively clear 2.4 GHz digital video feed, with a large 3.5” LCD display that lets you control everything — like the volume, brightness, two-way talking, lullaby music player, and even more settings. You can also keep track of the room’s temperature. The camera itself (which can be mounted on a wall, if you’d like) has a pretty generous flexibility — although we wish we could remotely pan and zoom. But perhaps this will make up for it: With the touch of a button, you can record what’s going on in your baby’s room (on the included microSD card). Not just snap a photo — but actually record video. You can even set the record function to be automatically triggered by sound (so it won’t record an empty room or sleeping child). You can even expand the set to include four cameras, which automatically sync up for simple installation. To top it off, the LIVE SD 3.5 hooks up to Skype, so you can check in at work (on either PCs or Macs), as well as from your iPhone or iPad. Honestly, the most time-consuming part of the (very easy) installation is setting up the account with Skype and then downloading the mobile app. Downsides? It could use more music selections than the four pre-loaded options, but it’s an appreciated, unique feature as-is. And we wouldn’t mind the option to take still photos, either. If you’re looking to cover all monitoring bases — audio, video, and movement — we’re big fans of the 2.4 GHz Tommee Tippee set, which includes a 2.8” color screen (with zoom capabilities) and a surprisingly crisp video feed. We could tell you about the generous range (1,000 feet), secure digital technology, auto-channel selection (read: no static), and the convenient talk-back feature for remote soothing. But our favorite feature is the parent-unit locator for when you inevitably misplace the screen in the laundry room or back by the pool. Heed our warning: Fuzzy new-mom brain is real, and no one is immune. As a basic video monitor, it’s one of our favorites. But what sets the Tommee Tippee apart is the included sensor pad. Place it underneath your baby’s mattress, and it’ll alert the parent unit if there’s no movement (including breathing) for 20 seconds. You won’t use it for long (maybe a few months), but it’ll save you from running to the crib every five minutes and feeling for a rising chest in the dark. Although some online reviewers mentioned false alarms on the movement sensor, we didn’t have a single issue on four different tester cribs. We had some initial issues when hooking up the camera wirelessly, but it turns out we just had to change our computer’s SSID number (our wireless network name, which enables all wireless devices on a network to communicate with one another) to include only letters and numbers (no symbols). Besides that, the features are pretty stellar. You can use your iPhone (or iPad/iPod Touch) screen to pan around the room in a 350-degree rotation and a 70-degree tilt up and down, which is very unique. And although there’s a slight delay (due to the WiFi connection), the picture is clear in both day and night. You willneed WiFi to connect the camera, so keep that in mind before buying, but we had no issues checking in from our phone’s 3G network. We also love the two-way communication (so you can soothe your baby from virtually anywhere in the world! ), and the optional email/text alerts whenever your baby cries for a certain amount of time. To top it off — this is a good one! — you can even snap photos of your baby (or caregivers) and save them to your phone. 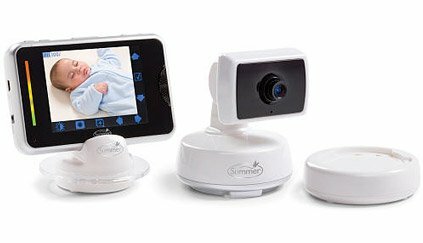 And because you can connect the camera to four different devices (with four different users sharing control), everyone can have access to your baby’s day-to-day activities. Note: If you don’t care about having a visual monitor, we actually prefer the EVOZ iOS monitor that has even more unique features for parents on the go. If you’re familiar with Skype and would prefer to use your iPhone’s Skype app, check out the Lorex Live Connect.